Brace yourself: Corporate earnings will be in focus this week, and it's not going to be a pretty picture. Earnings for the companies in the S&P 500 are expected to be down 1.2% in the first quarter, according to estimates from FactSet Research. That would mark the first overall decline since the third quarter of 2012, when earnings fell 1%. Companies in the energy and financial sectors should be the biggest losers, while telecommunications firms and utilities are expected to be the bright spots. The bad news shouldn't come as a surprise. Most of the 111 companies that publicly shared their earnings forecasts -- a so-called earnings guidance -- for the first quarter had a negative outlook, according to FactSet. It was unusually cold during the first quarter of the year, and storms in many parts of the country disrupted economic activity, which likely took a toll on companies' bottom lines. In addition, many companies that do business overseas have been hurt by unfavorable foreign exchange rates. S&P 500 companies generate just under half of their sales outside the United States, and the stronger dollar has been a major headwind recently. If there's any reason to cheer, it's that analysts predict relatively strong sales figures. Overall, revenue growth is estimated to be 2.3% in the quarter, according to FactSet. Alcoa (AA) is one of seven S&P 500 companies set to release results this coming week. The aluminum producer, which was considered the unofficial harbinger of the earnings season before it was pushed out of the Dow 30, is expected to suffer a 56% drop in earnings. But the main event will come Friday, when JPMorgan (JPM) and Wells Fargo (WFC) open their books. Analysts expect disappointing results from JPMorgan, the largest U.S. bank by assets. But they're holding out hope for Wells Fargo, the nation's fourth-largest bank. In other financial news, auto lender Ally Financial will go public this week. Ally was previously the lending arm of General Motors (GM) until the U.S. government had to bail it out in 2008. The IPO will reduce the government's ownership stake to 17%. The latest round of earnings comes as the market seems to be losing some momentum. 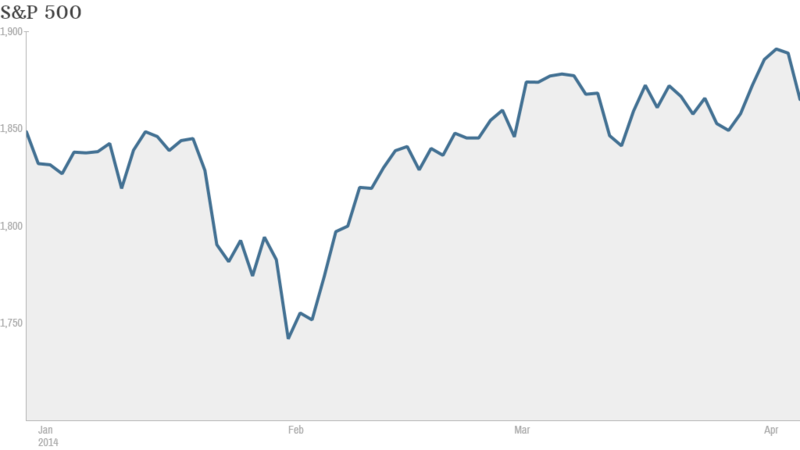 The Dow and S&P 500 both hit all-time highs last week in a broad based rally. But stocks sold off Friday, with technology shares leading the way down, as investors bailed out of companies that have been particularly hot. It's likely to be another bumpy week as investors try to sort out what the various economic and corporate reports mean.